The day started with the traditional St. George’s Day flag parade and renewal of promises before the Rainbows, Beavers, Brownies, Cubs, Guides, Scouts, Seniors, Explorers, and of course the leaders, we’re let loose to enjoy all the rides and attractions at Crealy! 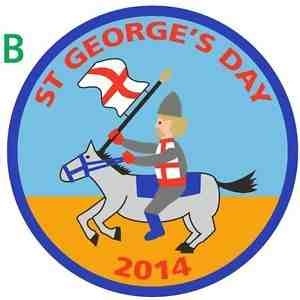 St. George is not only the Patron Saint of England but also of Scouting, so we decided we will celebrate St. George’s Day, Scouting, and Guiding with pride – whilst having fun! Congratulations to Bethany S from 4th Withycombe Raleigh Guides for winning this year’s badge competition. Bethany’s badge is shown to the right. The winners from above all got to attend St George’s Day free!